Pronouncing lighter cakes, fluffier mashed potatoes and more velvety textures, Mixmasters were scientifically tested for proper mixing speeds and outfitted with full coverage beaters which set them apart from other leading competitors of their day. This was ingenious because early mixers often got stuck just whipping up contents in the center of the bowl, but Mixmasters special over-sized beaters worked the entire rim of the bowl as well as the center eliminating the need for home cooks to stop the mixer and scrape down the sides. It is so easy to take this simple step for granted today but to fully understand the novelty of this ingenious appliance, we have to first travel back to the early 1900’s. Born from sweaty bread, the first standalone mixer was invented by Herbert Johnson after he witnessed an over-exerted baker with a drippy forehead hand mix a batch of bread dough. Clearly there was a better, more hygienic way than this, he thought and so he got to tinkering. Eventually Herbert came up with the Hobart – the first mixer for the commercial baking industry. That was in 1914. A speedy savior for anyone mixing large batches of anything, the Hobart came to be an important helper in commercial kitchens and rapidly shortened the time spent preparing food products for retail markets. It was so effective even the military put them to work. A decade later home-sized versions named Kitchen-Aids were introduced and women around the country marveled at the speed and efficiency with which they could whip stuff up. 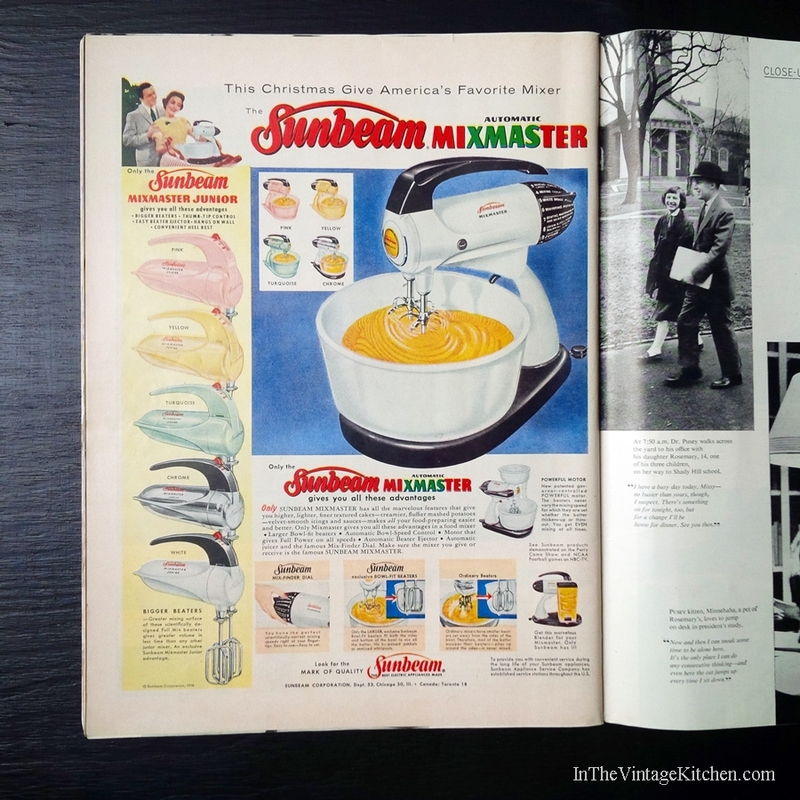 Sunbeam Mixmasters came along in the 1930’s and offered an improvement upon both the Hobart and the Kitchen-Aid varieties – interlocking yet detachable beaters. This meant even mixing and easy clean-up. Early models like this Mixmaster from the 1930’s look squat and a little primitive but they were true engineering marvels in their day. Originally Mixmasters were first offered in white with jadeite mixing bowls but soon graduated to a range of pastel colors with matching or milk glass mixing bowls. Matilda’s chrome style was introduced in the mid-1950’s and came with two bowls – large and small. Inspired by both the automobile industry and the airline industry the Sunbeam design engineers created attractive models with elegant lines, fin-shaped dials and stylized lettering reminiscent of the latest design trends in transportation. On the attachment front – Mixmasters also offered a bevy of functionalities. Everything from juicing to funneling, meat grinding to nut chopping could all be accomplished with one base unit and the appropriate attachment. Depending on the design and the decade that they were introduced, some of the attachments proved invaluable and were successfully continued for future designs. Others like the glass juicer were discontinued after a short run due to fragile composition. But when it came to the main mechanics of the Mixmaster body itself, they proved incredibly well made, thanks to the powerful motors that still hold up to the competition today. Which is exciting news for Matilda. She may be approaching the senior side at 60 years old but she’s still just as capable as ever. 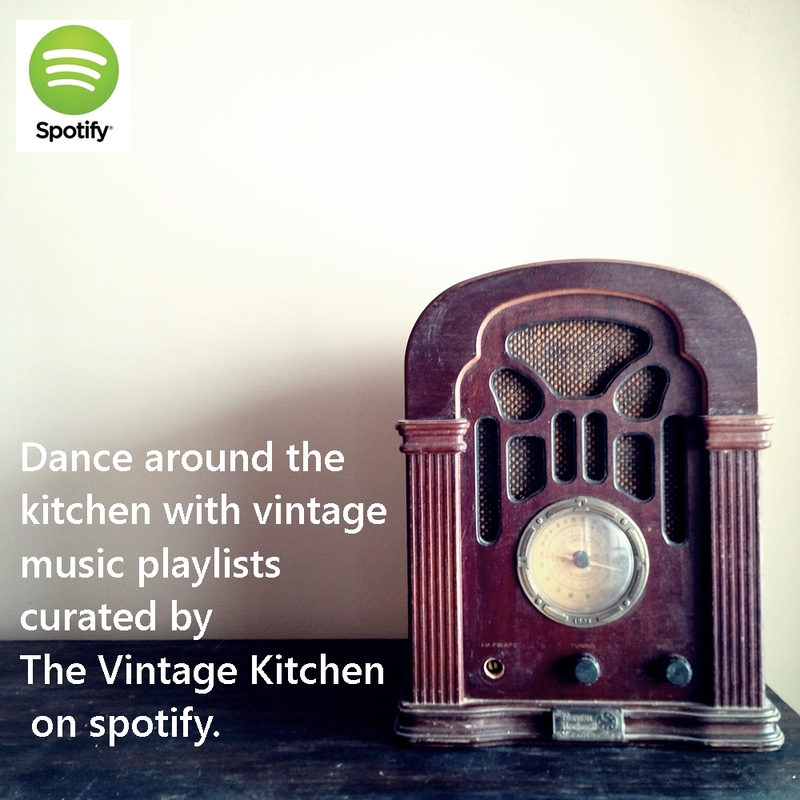 As a top of the line lady, she’s worked in some pretty great places but none hopefully will be more exciting or inspiring than her newly attained instructor’s position here in the Vintage Kitchen with us. For her birthday this year, Matilda’s going to get a little refresher in the decal department as well as a set of replacement beaters. 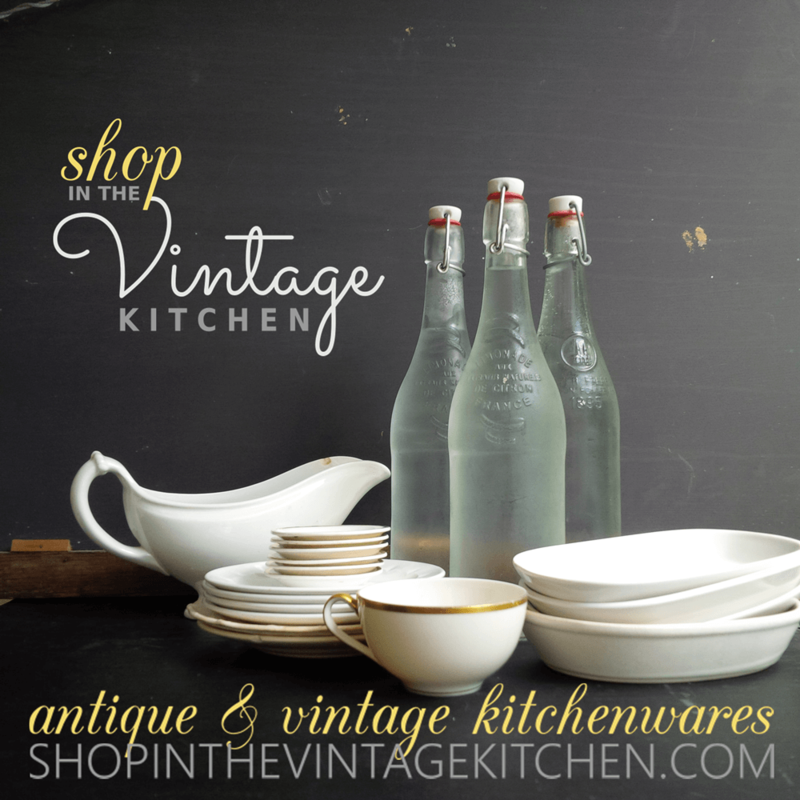 Then she’ll not only be practically brand new but also fully capable of whipping up a whole new century’s worth of recipes here in the Vintage Kitchen. When she’s all dressed up again, I’ll snap a photo so you can see! Looks aside, lucky for us, Matilda is chatty. In the whirl of her motor she shares the world of past baking endeavors through decades of cakes and cookies, casseroles and creams. She can’t wait to share her favorite mixtures with you, so stay tuned for some stories. Cheers to Herbert and Hobert for mixing it all up in the beginning. And a big welcome to Matilda – the new master of all our mixing here in the Vintage Kitchen. CURIOUS which modern-day mixer brands come out on top? 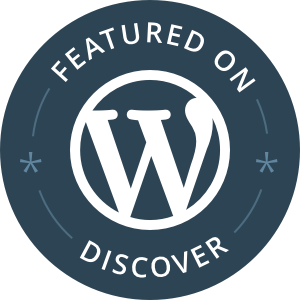 Check out what the team at Reviews.com found out after they tested 12 different contemporary models here. Unfortunately, Matilda’s Mixmaster family didn’t make an impact on their top-three list, but that’s okay because she will always reign supreme in our Vintage Kitchen. 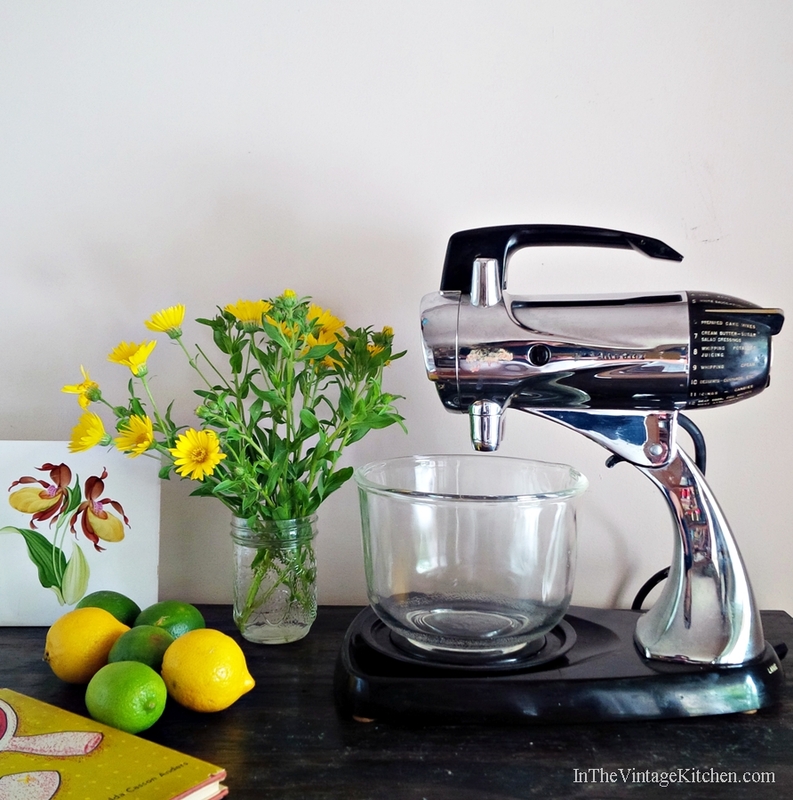 Vintage mixmasters can be elusive little gems, so in case you can’t find your own vintage Matilda, reviews.com recommends a new-but-looks-retro mixer, The Smeg, which they voted one of the top three stand mixers in both style and performance. Thank you so much Pat! Matilda sends a big cheers your way! Congratulations on your new home Matilda! Your in good hands In the Vintage Kitchen. Oh thank you Marianne and a big whirl your way from Matilda. Stay tuned for lots of fun recipes coming soon! I think I’m going to like Ms. Matilda! Oh thank you and right back at you! Shes definitely a charmer that’s for sure!